I recommend the Las Vegas Strip walks listed below, though of course this list is pretty subjective. I'm stringing these together North Strip to South into a single walk you could do in one afternoon over many hours, though ideally you'll see Las Vegas at a slower pace. Wynn: From the front huge waterfall in front to side waterfalls, exit or enter the Wynn at the side that is across from the Palazzo to see some of the most dramatic water landscaping anywhere. Roam around the Wynn a bit, and then head out and over the street on the footbridge/escalator at the south end of the building to the Palazzo. The Palazzo and Venetian: Las Vegas' newest hotel is the luxurious Palazzo, part of the massive Venetian Hotel and Casino / Sands Convention Center empire. From the Palazzo Lobby you can walk to the pretty indoor waterfall and some halls and over to the Venetian Hotel's amazing indoor canal. Complete with Gondolas, restaurants, luxury shops, and afternoon opera and performances the Venetian has in my opinion the greatest appeal of all the Las Vegas themed hotels. In the Grand Hall sit and have a coffee and listen to the players sing. Leave the Venetian via the massive moving walkway complex at the "front" and south of the building, which takes you back down to Las Vegas Boulevard. Next you'll walk a bit down the strip to Paris Las Vegas which is impossible to miss thanks to the half scale (which I think translates into 1/4 the volume) replica of the Eiffel tower with the massive legs literally buried in the casino floor. Stroll the charming Parisian "Street" in the hotel area and consider a trip up to the top of the Tower, which costs about $10 but offers neat views of the surrounding area. If you know the *real* Eiffel Tower this is not remotely in the same league as a travel experience, but like the hotel it's a neat replica and a tiny taste of the real France. Head back out to Las Vegas Boulevard and the Strip. Almost directly across from Paris Las Vegas are the magnificent Bellagio Fountains, which I think is the world's premier synchronized fountain/music displays. This is a "must see" in Las Vegas - a beautiful lake a large city block long filled with hugely powerful fountains that shoot off in synch with music from a powerful outdoor sound system. Views are good from anywhere, but I think the best view is near the middle of the block where you can realize the gigantic size of the display. After the fountains you'll head to the Bellagio's *north* entrance. Don't try to get in from the Bellagio's South side - you'll have to walk a lot of extra distance to get in. Once inside the Bellagio, visit the lobby area for the Glass Sculptures, the Conservatory for amazing landscaping which changes with the season, the amazing huge Chocolate fountain in the "Spa" wing, and just take in the general opulence of this magnificent venue. Another walk that is away from the Las Vegas Strip area is the key "big" attraction in Downtown Las Vegas is the Fremont Street Experience, a huge video presentation on a canopy that stretches over the entire street for several blocks. This is worth seeing and to get there simply ride the Deuce bus for $2 from the Strip to Fremont street and back. Take a few hours to stroll the downtown area which in my opinion gives a better feel of "historic" Las Vegas than the strip where the mega casinos are much more amazing and extravagant but also are little empires unto themselves. 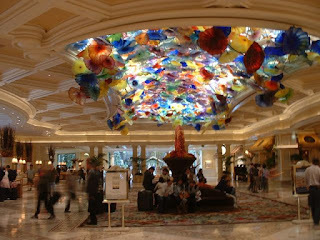 The Bellagios Sculpted, hand made glass ceiling display we posted about earlier is one of the many spectacular amenities at the world class Bellagio, which along with the Wynn and the Venetian seem to have the best reputation in Las Vegas for "splendor", though splendid and extravagant decorations are hardly lacking in Las Vegas along the strip. Next post: For a first visit to Las Vegas I'll recommend walks in order of the "interesting" factor, though of course this is pretty subjective.